Plessey, Anvil Semiconductors and the University of Cambridge to use Anvil's 3C-SiC / Si substrates. Plessey, Anvil Semiconductors and the University of Cambridge have announced that they are working together to fabricate high efficiency LEDs in cubic GaN grown on Anvil's 3C-SiC / Si substrates. Cubic GaN has the potential to overcome the problems caused in conventional LEDs by the strong internal electric fields, which impair carrier recombination and contribute to efficiency droop. This is particularly true for green LEDs where the internal electric fields are stronger and are believed to cause a rapid reduction in efficiency at green wavelengths known as "the green gap". The availability of cubic GaN from a readily commercialisable process on large diameter silicon wafers is as a key enabler for increasing the efficiency of green LEDs and reducing the cost of LED lighting. The collaboration, which is partly funded by Innovate UK under the Â£14m Energy Catalyst Programme, follows on from work by Anvil Semiconductors and the Cambridge Centre for GaN at the University of Cambridge where they successfully grew cubic GaN on 3C-SiC on silicon wafers by MOCVD. The underlying 3C-SiC layers were produced by Anvil using its patented stress relief IP that enables growth of device quality silicon carbide on 100mm diameter silicon wafers. 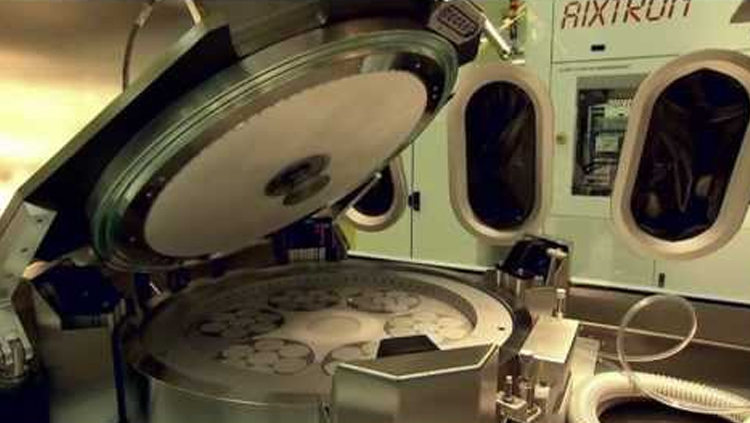 The process is readily migrated onto 150mm diameter wafers and potentially beyond without modification and is therefore suitable for large, industrial-scale applications. Plessey has started to commercialise LEDs produced in conventional (Hexagonal) GaN grown 150mm silicon wafers using IP originally developed at The University of Cambridge. Anvil's high quality 3C-SiC on Silicon technology, which is being developed for SiC power devices, provides an effective substrate, to allow single phase cubic GaN epitaxy growth and provides a process which is compatible with Plessey's GaN on Si device technology. Keith Strickland, the CTO of Plessey commented: "At Plessey we are constantly striving to find novel technology that can enhance our LED products. The work that has previously been carried out at the University of Cambridge in collaboration with Anvil Semiconductors has demonstrated that high quality cubic-GaN can be grown on large area Si substrates compatible with our manufacturing process. This has opened up the possibility to develop green LEDs with high efficiency that will allow us to demonstrate a new generation of efficient and controllable lighting products." Professor Sir Colin Humphreys,director of the Cambridge Centre for GaN, added: "The properties of Cubic GaN have been explored before, but the challenges of growing this thermodynamically unstable crystal structure have limited its development. The high quality of Anvil's cubic SiC on Si substrates and our experience of developing conventional GaN LED structures on large area wafers have enabled a breakthrough in material quality. This latest project will build on our ongoing collaboration with Plessey to deliver, for the first time, green LED devices with efficiency approaching that in blue and red LEDs." Jill Shaw, CEO of Anvil, added: "Our cubic SiC on Si has unlocked a route to large area growth of cubic GaN. We are delighted to be collaborating on this exciting project that offers the possibility of exploiting our technology in high efficiency LEDs as well as in our core low cost, high efficiency power electronics markets."